CLEVELAND (AP) In a story Dec. 15 about Yonder Alonso's trade to the Chicago White Sox, The Associated Press reported erroneously that Alonso is married to the sister of star slugger Manny Machado. Machado is married to Alonso's sister. 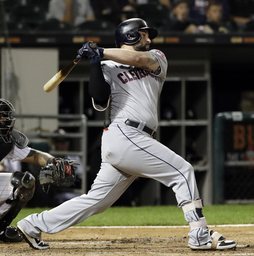 CLEVELAND (AP) - The Cleveland Indians have made another offseason move, trading first baseman Yonder Alonso to the Chicago White Sox. Cleveland gets 24-year-old outfielder Alex Call in a deal made official Saturday. Call has yet to make his major league debut. The Indians also rid themselves of Alonso's entire $8 million salary for 2019. It's been a busy week for the three-time AL Central champions, who traded slugger Edwin Encarnacion and infielder Yandy Diaz and re-acquired first baseman Carlos Santana in a three-team trade on the final day of the winter meetings in Las Vegas. "We've had a couple of goals going into the offseason and that's foremost trying to make sure we have a team that's capable of winning the American League Central in 2019 but also position the organization for sustained success beyond that," Indians president of baseball operations Chris Antonetti said. "There are a couple ways to do that. One is to infuse young, controllable talent into the organization. The second element of that is to manage our finances. We feel like the series of moves we've made up to this point advances both of those goals." Cleveland may not be done. The club has considered trading either ace Corey Kluber or All-Star Trevor Bauer. The Indians have outfield needs and are looking to rebuild their bullpen. Alonso batted .250 with 23 homers and 83 RBIs in his only season with the Indians, who signed him as a free agent last December. It was the first trade between the AL Central rivals in more than two decades, and it could have broad implications for the rest of the offseason. The 24-year-old Call played for Class-A Winston-Salem and Double-A Birmingham last season, batting .248 with 12 homers and 58 RBIs in 123 games. He was selected by Chicago in the third round of the 2016 draft out of Ball State. AP Sports Writers Tom Withers in Cleveland and Jay Cohen in Chicago contributed to this report.